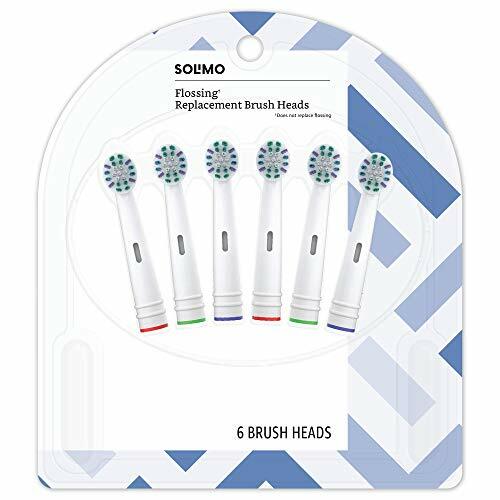 Solimo Flossing Replacement Brush Heads fits most Oral-B electric toothbrushes (Does NOT fit Vitality Sonic, Oral-B Sonic Complete, Pulsonic, CrossAction Power battery toothbrush, Oral-B Complete battery toothbrush, and 3D White battery toothbrush).‡ The unique flossing bristles pentrate deep between teeth for effective cleaning while the light green bristles fade with use to remind you when to replace your brush head. ‡Oral-B, Vitality, CrossAction Power, Oral-B Sonic Completeand Oral-B Complete are registered trademarks of The Procter & Gamble Business Services Canada Company. 3D White is a registered trademark of The Procter & Gamble Company. Pulsonic is a registered trademark of Braun GmbH.